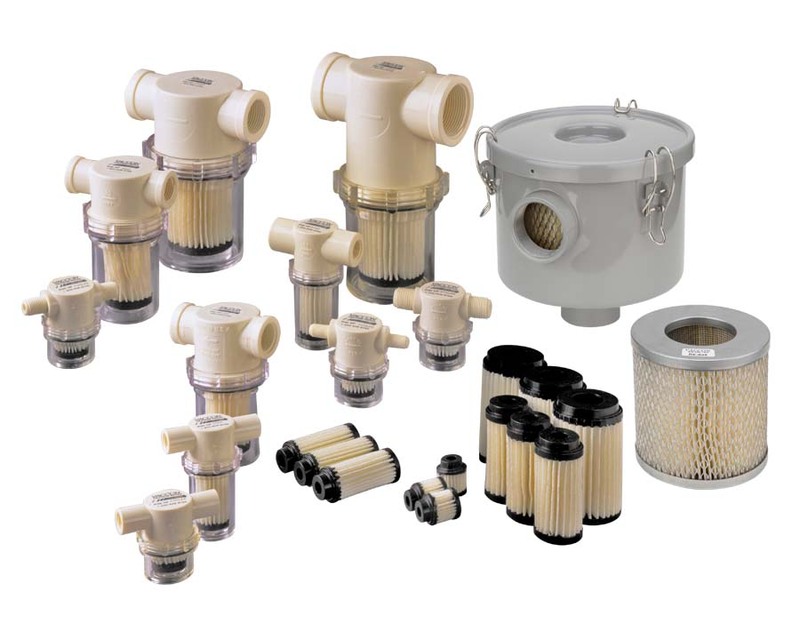 Add Vaccon’s compact in-line vacuum filters to vacuum lines or air-supply lines to trap dirt and debris from entering the process, or to the exhaust port to capture airborne contaminants. Vaccon’s pleated-element design offers a filter with significantly longer life and much higher flow capacity than non-pleated, porous plastic designs. The large surface area increases filter life while reducing maintenance costs. The durable injection molded nylon and polycarbonate construction of the VF models and the metal construction of the VFC-1500F handle the most challenging environments. Vaccon In-Line Vacuum Filters are ideal for dirty and dusty applications such as material handling equipment, printing, paper and pulp, The 10-micron paper filters are rated for full vacuum to 150 PSI [10 bar] pressure. You can use Vaccon inline-filters in conjunction with any manufacturer’s vacuum pumps. Please note, under normal conditions, Vaccon’s unique single-stage pumps do not require filters for maximum operating efficiency. Dimensional data for the In-line Vacuum FIlters is presented in 2D drawings, with all critical dimensions and port thread sizes displayed.